Abstract: Nowadays, the number of pets in the Republic of Korea (ROK) is continuously growing, and people’s perception of animals is changing. Accordingly, new systems and services for them are emerging. Despite such changes, there are still many serious problems such as animal cruelty, abandonment, and factory-type breeding places. In this study, we have conducted a research on the design of a humane animal care system and its implementation with Java. The methodology involved in the design will enable managing animals' safety and health by systematically categorizing and studying each health-related issue for protection. Moreover, with this methodology, animals can avert risks through periodic examinations, and the analyzed data will be useful in managing animals efficiently. Thus, this paper proposes a system that monitors whether the owners actually carry out such obligation. Authors expect this convenient, easily accessible system to lead to a more humane approach to the animals they own. The authors plan to establish an animal care network together with local animal associations for the active promotion of the system implemented in this study, in the hope that the network will be extended nationwide. One of the issues in the daily life of a Korean deals with spending a happy life with his/her pet(s) as the number of family members is decreasing rapidly due to the avoidance of having children. Nowadays, one of the problems emerging in the Republic of Korea (ROK) is animal cruelty. Currently, many animals worldwide are being exposed to abuse. In order to achieve such life, a systematic animal management system is required but has yet to be introduced in ROK. As such, the number of animals living under life-threatening conditions is not decreasing. Such situation should be improved immediately by introducing an effective system. This study aims to assist in this scheme [ 1 - 3 ]. In addition, the Ministry of Agriculture, Food, and Rural Affairs (MAFRA) of ROK has recently decided to impose harsher penalties for negligence in supervising pets considering the continually growing number of fatal accidents involving them. In particular, MAFRA has increased the fine for those who neglect to use a leash or a muzzle in public areas and announced that they will be further strengthening guidance and control. Under the current Animal Protection Law (ROK), those who do not clean pet waste or use a leash in public areas will be fined a maximum of KRW 500,000; under the enforcement ordinance, however, the enforceable fines are KRW 50,000, 70,000, and 100,000 for the 1st, 2nd, and 3rd violations, respectively, so the effectiveness of such law is being questioned. Therefore, MAFRA decided to amend the enforcement ordinance to increase the fines to KRW 200,000, 300,000, and 500,000 for the same violations. Additionally, they plan to amend the law itself to increase the penalties drastically for all the relevant cases of negligence. The existing Korean law classifies the Tosa dog, American pit bull, American Staffordshire Terrier, Rottweiler, and their hybrids as ferocious dogs, but MAFRA plans to expand the category by adding the types of dogs designated as dangerous or ferocious in other countries and obligate their owners to use proper leashes or muzzles. 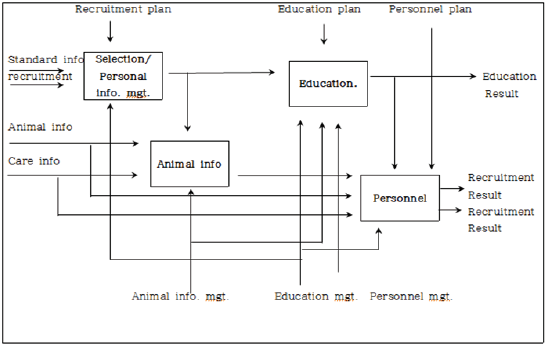 Thus, a research on the design of human-animal care system was conducted, implementing it with Java. The contribution of the thesis is that by systematically classifying the issues pertaining to the animal health and studying them closely a software-engineering design methodology which will be able to efficiently manage animal’s safety and health can be established. Through this methodology, the possible health risks can be avoided through periodic examinations (animal health management) to efficiently and effectively manage animals. A monitoring system that checks whether the pet owners are actually complying with the legal obligations has been proposed in this thesis. The study is composed as follows: Section 2 introduces the related works while Section 3 describes the design of humane animal care system and its Java implementation. Section 4 deals with the comparative study which compares the Pet IoT (LG Uplus Company, 2017) with the proposed system. The last chapter includes the conclusion and future work plan. The localization of multi-agents, such as people, animals, or robots, is a requirement to accomplish several tasks. Especially in the case of multi-robotic applications, localization is the process of determining the positions of robots and targets in an unknown environment. Many sensors like GPS, lasers, and cameras are utilized in the localization process [ 4 - 6 ]. One out of five South Koreans is living with dogs and cats, and they consider them their family. According to the MAFRA, the population who keeps pets is approximately 10 million, and the number of pets officially registered as per the Pet Registration Act, which became effective in 2013, is about one million [ 7 - 10 ]. This number will increase considerably when unregistered animals are counted additionally, and most of these unaccounted animals are actually being abandoned. Moreover, the statistics by MAFRA show that animals abandoned on the streets number more than 80,000 annually, with dogs accounting for 7 out of 10 (59,000). The rest are cats (21,000) and others (1,000). These numbers represent only those animals that had been captured and brought into animal shelters, so it is not clear how many more are out on the street [ 11 - 15 ]. Still, it is encouraging that the numbers have been decreasing each year since 2010. Table 1 shows the status of abandoned pets in the last 5 years. Animal cruelty literally means an act of inflicting pain and suffering on all animals excluding humans without reasonable cause. Even if there are rightful objectives (e.g., lawful scientific experiments, raising them as food source, etc. ), abuse and excessive violence against animals can be defined as animal cruelty. Table 2 shows annual violations for the last 5 years. In ROK, the number of animal cruelty cases started to increase in 2012, but the rate of increase has been dropping since 2016 when society took the problem seriously. Nevertheless, the problem of animal cruelty remains strong, and the punishment is quite insufficient [ 16 - 22 ]. People with pets should always pay attention to their management as to what kind of situation or problem would arise. Especially, they need to be careful about losing their pets. People tend to search for their lost pets by distributing flyers, searching the websites for lost pets, and checking animal shelters; realistically, however, these methods are ineffective and classic ones. Although the government has enforced the animal registration system since 2013 to promote the recovery of lost dogs, the effectiveness of the system still depends on the owners’ will as the fine is very low, and not many people really know about it, so owners of lost pets resort to the old way. Even now, many animals are being exposed to cruelty; once a strict and systematic legal system is established, however, the number of animal abuse cases will hopefully be reduced significantly. For example, in Germany, those who killed, abused, or did not feed or provide proper care are punished with maximum fine of EUR 25,000 and confiscation of the animal they own or prohibition of animal ownership, not to mention a possible jail term of up to 3 years. HIPO chart of Humane Animal Care. Human and animal care plan based on respect for life. 1) Selection/Personal information management: Register and manage the personal information of a person approved for adoption through a selection process. Analyze the information of those registered and refer them for other processes. 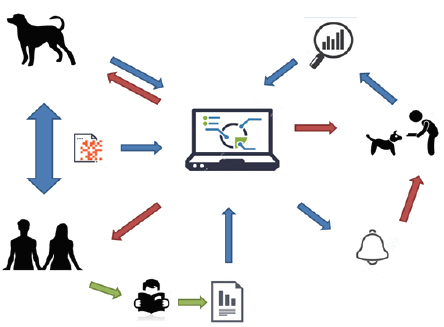 2) Animal information management: Carry out the task of managing animal information along with health and behavioral data. The information collected at this stage is used for later evaluation for personnel management. 3) Education management: In this task, adopters receive animal training education prior to adoption. 4) Personnel management: Evaluate the animal management ability of the adopters and their personalities. Some adequate alternatives will be given when necessary. Fig. 1 shows the HIPO chat of Animal Care, and Fig. 2 presents an animal care plan based on respect for life. This makes sense as animals are another form of life that should be respected and cared for. We hope that the system to be developed with our design methodology will contribute to such practice. Fig. 3 illustrates the Humane Animal Care System in BPM. Likewise, Fig. 4 shows Selection/Personal Information Management in BPM. Humane Animal Care System in BPM. 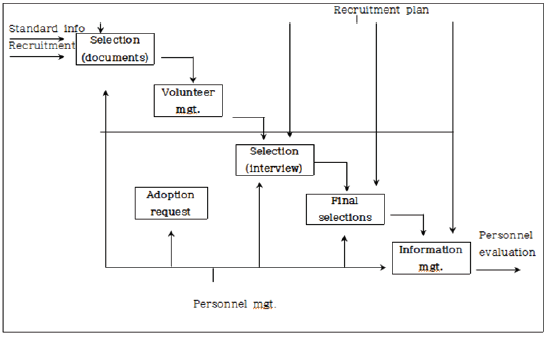 Selection/Personal information management in BPM. Fig. 5 depicts the real-time animal localization system for animal care based on GPS and Bluetooth technologies. This system is divided into four domains: Mechanical Connection, Object Location Analysis, Location Transmission, and Location Output. The mechanical connection domain connects the equipment that notifies the location in real time with the equipment or device that displays the location and a mobile phone using Bluetooth technology. The object location analysis domain collects the location of an object in real time. The location transmission domain then analyzes the data obtained for the currently located object using a mobile phone. Finally, the location output domain displays the location of the object on a map based on the analyzed data and sends it to the UI. 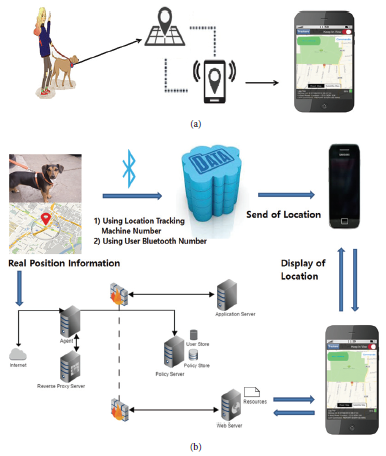 Real-time animal localization system for animal care using GPS and Bluetooth. (a) Bird’s-eye view diagram. (b) Service diagram. The Unified Modeling Language (UML) implemented with Java is as follows. 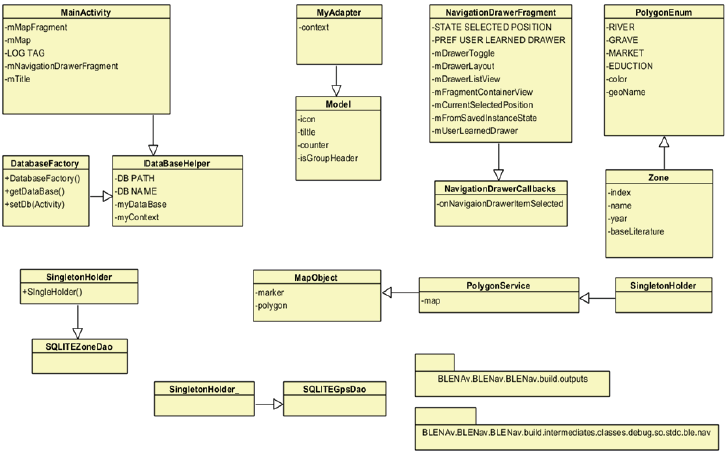 There is MainActivity in the UML in Fig. 6. 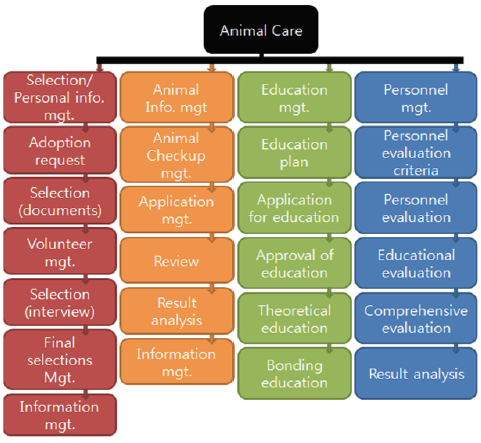 Since the data pertaining to adoption requirements (i.e., tests and survey results) and basic personal information are generated at AnimalCare, an application that can manage these data is necessary. The UML introduced here can be used for this purpose as well as for the management of the entire system to perform localization. In the UML, DataBasehelper is connected with MainActivity. The DataBaseFactory connected to DataBasehelper can be considered the part that manages data. In other words, it is the storage space where data are being accumulated. DataBasehelper assumes the role of assisting in data retrieval from DataBaseFactory. Meanwhile, MyAdopter establishes a direct connection to achieve mechanical connection. This function is needed to connect the machine that locates the animal with the user’s machine, which uses the Bluetooth-based real-time localization system. SQLte is not a server but a light database where an application program is embedded. The data pertaining to Zone, GPS, and Map will be managed here. A map program such as Google maps is executed through the MapObject connected to PolyGonService to summon a map that will be used by the MapObject program next to it. NavigationDrawerFragment uses the real-time location-based system to set a route by analyzing the current locations of the owner and animal. In PolygonEnum, an animal entity is defined and distinguished. It stores the details of data in the Zone and distinguishes the object based on this Zone. In the UML diagram, several functions are hidden except the class name and core function. This is because program registration in Korea is proceeding. On the other hand, this paper is a contribution that includes a software engineering approach. After registering the program, we are aiming at patent application and registration, so there are a lot of UI/UX contents. Implementation of real-time location-based system for animal care using Java. 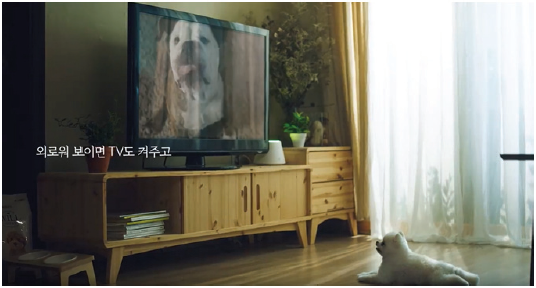 The prototype of the Pet IoT developed by ROK’s LG Uplus Company is one of the products created from other studies. 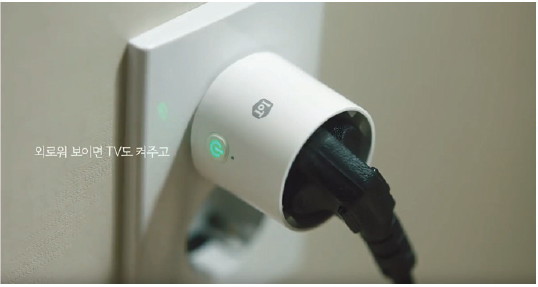 Pet IoT is an official product recommended by the Seoul Veterinary Medical Association and is available in a package consisting of Home CCTV Mini, IoT plug, and IoT switch. As shown in Fig. 7, the pet owner can check the condition of the pet left at home alone when he/she is out via the image transmitted to his/her smartphone in real time or let the pet having separation anxiety listen to his/her voice using the bidirectional voice communication function. Moreover, the company offers three kinds of friendly animal character accessories that can be attached to Home CCTV Mini. Pet IoT of LG Uplus Company. UI and available services offered by Pet IoT. Home CCTV Mini allows bidirectional voice communication with the pet while watching the Smartphone images; with the support of the 142° wide angle camera that minimizes the blind spots inside the home and the 128-GB SD card, it is possible to record images or schedule recording up to 50 days. Moreover, supported by the 2 million-pixel full HD-class image quality and up to 4X zooming function, it can set or schedule time slots for intrusion detection. This function immediately notifies the owner of the movement with a text message when it has been detected. At the same time, it automatically stores the images taken 20 seconds before and after the detection in the U-Plus Box Cloud. Pet IoT offers different rate systems: users can either use Home CCTV Mini only or choose to add other IoT functions (e.g., switch, plug, hub, etc.) that could be useful to their pets. The UI and available services offered by Pet IoT are shown in Fig. 8. Figs. 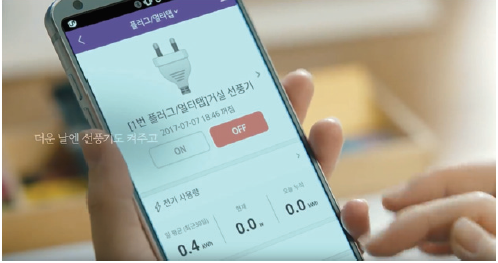 9 and 10 present a Pet IoT service example of LG Uplus. The core of Pet IoT is a combination of Smartphone-based CCTV monitoring, voice communication, and power control for operating household appliances such as electric fans, TVs, or lights. Table 3 shows the comparison results between the existing Pet IoT being serviced since 2017 and the proposed system. While the former system monitors the animals indoors using the intelligent CCTVs, the latter can monitor them outdoors as well with a Bluetooth collar which can monitor abnormal animal behaviors and prevent their losses. Pet IoT service example of LG Uplus (1). Pet IoT service example of LG Uplus (2). A research on a humane animal care system and its method of implementation has been conducted in this study. The methodology involved in the design will enable managing animals' safety and health by systematically categorizing and studying each health-related issue for protection. Moreover, with this methodology, animals can avert risks through periodic examinations, and the analyzed data will be useful in managing animals efficiently. At the same time, a GPS and Bluetooth-based method of preventing pet losses has been proposed. The program for this method can be run by simple operations. Real-time localization using this program will be able to deal with unexpected loss of pets. Thus, this paper proposes a system that monitors whether the owners actually carry out such obligation. We expect this study to be useful in managing animals and dealing with a pet loss situation. The authors plan to establish an animal care network together with local animal associations for the active promotion of the system implemented in this study, in the hope that the network will be extended nationwide. This work was supported by the National Research Foundation of Korea (NRF) grant funded by the Korea government (MSIT) (No. 2017R1C1B5077157). The first draft part of this paper was presented in at the 11th International Conference on Multimedia and Ubiquitous Engineering (MUE 2017), May 22-24, 2017, Seoul, Korea. He is undergraduate student of Department of Software, Catholic University of Pusan, Korea. He was benefit Ministry of Education, National Research Foundation of Korea, as well as the CK Project Group. He received B.S. and M.S. in Engineering degrees from Department of Computer Science, Sogang University, Korea in 1990 and 1992, respectively, and Ph.D. in Science degree from Department of Computer & Statistics, Daegu Catholic University, Korea in 1998. Currently he is Professor (Tenure) of Department of Software, Catholic University of Pusan, Korea (2001-). Also, he Dean College of Applied Sciences of Catholic University of Pusan, Korea (2018-). And, he is Dean of CK Project Group (4D Health Care Project Group), Ministry of Education, National Research Foundation of Korea. His research interests are intelligent system, fuzzy system, AI. He was born in Kyoto, Japan. He was finished the Cooperative Marine Science and Engineering Program, Texas A&M University at Galveston, USA in 2006, received B.S. in Science degree from Department of Major of Applied Marine Sciences (Currently Faculty of Marine Biomedical Sciences) and B.S. in Engineering degree (Double Major) from Department of Major of Computer Engineering from Jeju National University at Ara, Jeju, Korea in 2007. And he has a completion of the Secondary School (Middle and High schools) Teacher Training Curriculum in accordance with Republic of Korea Secondary Education Act (Aug. 2007), and received M.A. in Education degree from Department of Major of Computer Science Education, Graduate School of Education, Pukyoug National University, Busan, Korea in 2012. Also he has a completion of the Secondary School (Middle and High schools) Teacher Training Curriculum in accordance with Republic of Korea Secondary Education Act (Aug. 2012) and received the Ph.D. in Engineering degree from Department of Major of Computer Engineering, Graduate School, Pukyoug National University, Busan, Korea in 2016. He received the Best Paper Award from Korea Multimedia Society nine times (Nov. 2014, May. 2015, Nov. 2015, May, 2016. Oct, 2016, May, 2017; three times, Oct, 2017). And he received Undergraduate Student Paper Bronze Medal (corresponding author) Awarded, Korea Information Processing Society (Apr. 28, 2017). Also, he received Best Paper Award of the 10th 2016 International Interdisciplinary Workshop Series from HSST (Aug. 2016). Also, he received Best Paper Award of the 16th International Conference on Control, Automation and Systems (Oct. 2016), ICROS with IEEE Xplore. He has been serving as chairs in some conferences and workshops; MUE 2017, BIC 2017, CUTE 2017, WITC 2018, MUE 2018, PDCAT 2018, BIC 2018, CUTE 2018, CSA 2018, WITC 2019. He is Technical Committee at IFAC (International Federation of Automatic Control), CC 1 (Systems and Signals), TC 1.5. (Networked Systems) (2017-2020). And, Technical Committee at IFAC, CC 3 (Computers, Cognition and Communication), TC 3.2 (Computational Intelligence in Control) (2017-2020). Technical Committee at IFAC, CC 7 (Transportation and Vehicle Systems), TC 7.2. (Marine Systems) (2017-2020). Currently he is Associate Editor at Human-centric Computing and Information Sciences (HCIS), Springer Berlin Heidelberg (SCIE/SCOPUS indexed). Also, he is Associate Editor at Journal of Information Processing Systems (JIPS), Korea Information Processing Society (SCOPUS/ESCI indexed) and a Research Professor of Dankook University, Yongin, Korea (Jul. 2016–Sep. 2016). Currently he is Assistant Professor of Department of Software, Catholic University of Pusan, Korea (Dec. 2016–). His research interests are green IT, smart grid, network security, IoT, system architecture.